 Paulo and Bill serves Sunday Brunch Buffet each week from 10:00am until 2:00pm. Join us for a large selection of items. $20.95 Adults / $8.50 Kids 3-10 years old. Prices may vary on holidays.